See the exhibition you helped create! Boston loves Impressionism and always has. For the first time, the Museum of Fine Arts, Boston, invited the public to choose works for a special Impressionist exhibition. Choosing from a different themed group each week, fans voted for their favorite paintings from a selection of fifty works from the MFA’s Impressionist collection, with the top thirty picks earning a spot in the exhibition “Boston Loves Impressionism.” Voters made plain their love for Vincent van Gogh’s masterpiece, Houses at Auvers (1890), which earned the most votes (4,464), edging out Claude Monet, who came in second place with 3,543 votes for his iconic Water Lilies (1907). 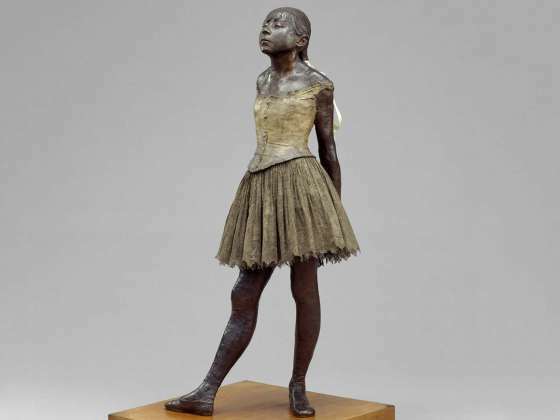 Third place was taken by Edgar Degas’ Little Fourteen-Year-Old Dancer (original model 1878–81, cast after 1921)––the only sculpture in the contest. These three top vote getters hold a place of honor at the entrance of the exhibition. Come see the exhibition that you helped to create. The exhibition was conceived by Malcolm Rogers, the MFA’s Ann and Graham Gund Director. While renovations take place in the large Sidney and Esther Rabb Gallery of European Impressionism, Rogers was looking for a way to keep many of the works on view, and had the idea to get the public involved in choosing which ones by asking them to share their favorites. The exhibition also includes a case of letters, including one from Monet (to Boston collector Thomas Sergeant Perry) as well as photographs, newspaper clippings and exhibition catalogues tracing the early history of Impressionism in Boston and at the MFA. Above: Vincent van Gogh, Houses at Auvers (detail), 1890. Oil on canvas. Bequest of John T. Spaulding. 2/14/14 Boston Globe "Van Gogh in new MFA show"
2/14/14 Boston Herald "Ahead of the Game"
2/2/14 Boston Sunday Globe "MFA set to open its first crowdsourced exhibit"
See the top thirty works that grabbed a spot in the exhibition.